ONTARIO RANCH, Calif.--(BUSINESS WIRE)--Aug. 16, 2018-- KB Home (NYSE: KBH) today announced the grand opening of Northpark in Ontario Ranch, the builder’s latest community of one- and two-story new homes in a prime Inland Empire location. Northpark is convenient to Interstates 10 and 15, Highway 60, and Metrolink® stations, offering easy commuting throughout Riverside, San Bernardino, Orange and Los Angeles Counties. Situated within the desirable Mountain View School District, Northpark’s location in the thriving Ontario Ranch neighborhood is convenient to the best that the Inland Empire has to offer. Residents can spend their free time browsing the charming shops and eateries in Upland and Ontario’s historic downtown districts, while Victoria Gardens, Ontario Mills® and Eastvale Gateway are top retail, dining, and entertainment destinations. The community features a planned private park with a basketball court and is also close to Prado Regional Park, where visitors may enjoy hiking and biking trails, disc golf, archery, a dog park, picnic facilities and play equipment. Northpark is also near the Claremont Colleges, Ontario International Airport and Ontario Business Bank Arena. KB Home will host a grand opening celebration at Northpark on Saturday and Sunday, August 18 and 19, from 10:00 a.m. to 6:00 p.m., during which attendees may tour the elegantly-appointed model homes. Refreshments and entertainment will be available from 12:00 p.m. to 2:00 p.m. on Saturday. 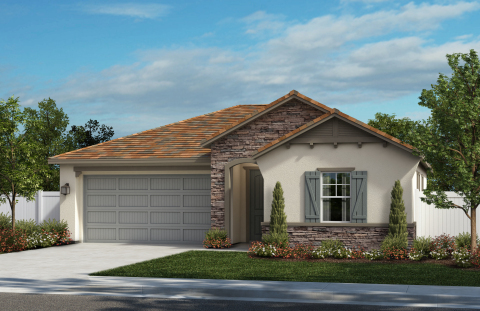 In total, KB Home will be constructing 190 one- and two-story homes available in four distinct floor plans. With up to six bedrooms and three bathrooms and ranging in size from 1,700 to 2,800 square feet, the KB homes at Northpark also feature such desirable design characteristics as spacious dens or loft spaces, ample storage, and dedicated laundry rooms. Pricing begins in the $460,000s. The KB homes at Northpark will be built to current ENERGY STAR® guidelines and include WaterSense® labeled faucets and fixtures, meaning they are designed to be more energy- and water-efficient than most typical new and resale homes available in the area. These energy- and water-saving features are estimated to save homebuyers between $2,028 to $2,340 a year in utility costs, depending on floor plan. As part of KB Home’s distinct homebuilding process, buyers may personalize many aspects of their new home to suit their budget and preferences. After selecting their lot and floor plan, KB homebuyers may work with expert design consultants who guide them through every aspect of the process at the KB Home Design Studio, a retail-like showroom where they may select from a plethora of design and décor choices, including countertops, cabinets, lighting, appliances and window coverings. The Northpark sales office is located at 2787 East Banner Street. From CA-60, exit Archibald heading south. Turn left on Parkview Street, and left on S. Wayne Avenue. Alternatively, from I-15, exit Limonite Avenue heading west. Turn right on Archibald Avenue, right on Parkview Street, and left on S. Wayne Avenue. Follow the signs to the sales center. The sales office is open Tuesdays through Sundays from 10:00 a.m. to 6:00 p.m. and on Mondays from 1:00 p.m. to 6:00 p.m. For more information about Northpark, or KB Home’s other new home neighborhoods, visit www.kbhome.com or call 888-KB-HOMES.